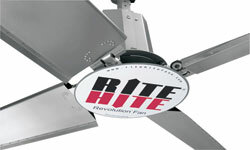 The Revolution fan is a high-volume, low-speed unit that provides more consistent air circulation and ventilation with better energy efficiency than traditional high-speed ceiling or floor fans. The fan features four contoured aluminum blades and a design that moves air more consistently across the whole blade, creating an airflow of more than 360,000 cubic feet per minute. The fan is available in 8, 12-, 16-, 20-, and 24-foot diameters. The blade-hub connection is rotationally balanced and uses a vibration-absorbing material that reduces stress by 50-75 percent to maximize fan life. The unit uses steel universal mounting brackets for easier installation. The mounting system includes a beam clamp, motor housing, stabilization cables and a three-way motor-to-hub safety connection.